Waffle flip-ability is a new standard feature of many best waffle makers. In this article, we’ll tell you our choice for the best flip waffle maker and why. You can also see our video of the waffle maker in use. Why use a flip waffle maker? Well, because many of the older stovetop waffle makers cooked the underside of the waffle better and quicker than the top side, appliance companies innovated by creating waffle makers with a flip function. That way both sides of the waffle get a chance to cook evenly, resulting in a more consistently cooked waffle. In determining our top choice of the best flip waffle maker, we considered a variety of factors. 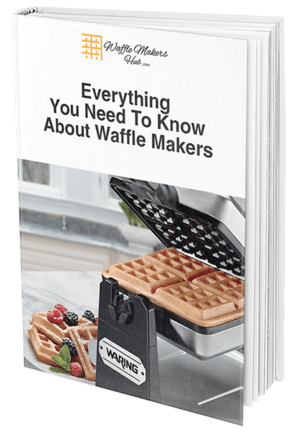 In our opinion, the Presto 03510 Flipside Belgian Waffle Maker is the best flip waffle maker on the market, so let me break down the details to explain why. Many “flip” waffle makers rotate by twisting 180 degrees horizontally. This requires that the machine be suspended in the air, and then, using your wrist, your turn the waffle maker. These traditional flip waffle makers are the kind that you often see in hotels. The Presto 03510 Flipside Belgian has an re-invented the flip waffle maker to save space through an innovative design. Instead of flipping horizontally, it flips 180 degrees along its hinge that stays on the ground. This saves space by not having to have the waffle maker suspended in air, and it works great! This waffle maker is easy to use. It doesn’t take too long to heat up, and it has a nice three-foot power cord. The way it works is that, as soon as you put the batter in, you flip the waffle maker along its axis so the batter will spread out to the opposite plate. This waffle maker is non-stick so you don’t need to worry about spraying it or melting butter and brushing it on. This Belgian waffle maker does not have removable plates, which some people see as a disadvantage since it has deep pockets. I don’t personally care for this feature though. My experience with the Hamilton Beach 26030 wasn’t that great. At least with the Presto, you won’t be stuck fiddling around with the iron plates trying to clip them back inside before using. And as a big bonus, this waffle maker is easy to store as it is possible to store in a vertical/upright position which means that it can be placed inside a cupboard, for example. More so, it takes approximately 2 minutes for the waffle maker to heat up, and a further 4-5 minutes to cook a crispy waffle. If your batter is really thick, you may need to set the timer for 6 minutes. This means that you can be feeding yourself, or your family, in under 10 minutes of cooking. That is super-efficient! The Presto comes with a digital timer that countdowns to tell you when your waffle is done. You set it by pressing the button to the number of minutes you want your waffle to cook. It will beep twice when there is a minute to go, and then five times when your waffle is done. Many of the other flip waffle makers don’t have a timer feature. This handy little feature makes sure your waffle won’t get burnt. This is ideal for busy mornings when your hands are full. Of course, you could just use a timer on your oven or on your phone, but I think its a nice add on to this waffle maker. Due to its flip-able function, this waffle maker creates perfectly crispy, and evenly golden waffles, every single time. The batter has a chance to settle on the top and bottom of the waffle, as it flips around, and therefore allows gravity to aid in perfect cooking. The hinge itself is nice and sturdy, and the lid allows enough room for the waffle to rise when cooking, which gives you a chance to peek at it to make sure that it is done whilst it is cooking. It is a lot more durable than other waffle makers that flip horizontally on the axis of the handle. With today’s technology, it only makes sense to pick a waffle maker that has a non-stick coating. This helps the waffle come off the griddle easier, without leaving loads of batter. You can then just use a kitchen brush to get out the crispy remains and wipe the griddle surface off with a damp cloth. I found the Presto 03510 waffle maker easy to clean and its non-stick surfaces worked well. Some of your batter or cooking oil may drip into the hinge area, so make sure you flip it over to clean both sides of the hinge when you are done. I also recommend that you wait till the waffle maker is cool before attempting to clean – otherwise you may burn yourself. Some of the flip waffle makers that I’ve used seem to get stuck when you turn them, and they can usually only turn one direction. That means if you try turning them the wrong way they may break. The Presto seems very durable and flips very easily. No need to worry about its rotating mechanism breaking, unlike with some other flip waffle makers. If you want to see a video demonstration of how durable this waffle maker is, along with some of its features, this may be helpful. This waffle maker is competitively priced with other flip-style waffle makers, which all usually sell for under $50. And of course, it is cheaper than double-flip waffle makers, like the Cuisinart WAF-F20, which usually run about $90. Given that this is well-built kitchen appliance that will last years, it is very reasonably priced. And from my perspective, feeding my family by whipping up some waffle batter from pancake mix is much cheaper than going to an IHOP or breakfast café every week! Similarly, the temperature control allows you to customize the waffle maker to cook the waffles to the perfect crispiness or softness that you want. If you want a crispier waffle, set the temperature higher and let the waffle cook a little longer. This is a great feature that also helps novice waffle makers because if you keep it on a low heat, there is less risk of a burnt waffle! Of course, the presto isn’t the only flip-style waffle maker on the market. Our choice for the runner-up waffle maker is the Hamilton Beach Flip Waffle Maker. You can check out our review of that here. Overall though, the Presto 03510 FlipSide Belgian Waffle Maker is a top-notch product, and will fulfill all your waffle making needs. I have no hesitations in recommending it!